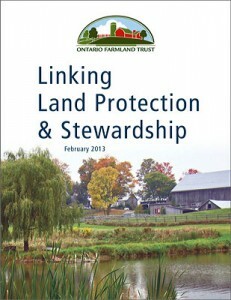 Orland Conservation recently completed the Linking Land Protection & Stewardship project with the Ontario Farmland Trust. In cooperation with the Ontario Land Trust Alliance and Ontario Stewardship network, OFT received a grant from the Ontario Trillium Foundation to undertake the project. Orland Conservation was retained to facilitate the project research, workshops, surveys and produce the final report. The goal of this one-year initiative was to bring together individuals, agencies and organizations engaged in land protection and stewardship activities, gather input and direction on how land conservation efforts can be strengthened, and learn how OFT can help facilitate enhanced collaboration among conservation groups throughout Southern Ontario. The project not only sought to bridge the direct land protection and land stewardship work being done by conservation groups within various communities, but also endeavoured to bridge interests in natural heritage and agricultural land protection.